During August 2005, a survey was conducted along the railroad track and a section of Highway 2, between Gelilot and Hof Ha-Sharon Interchange (Permit No. ; map ref. NIG 18250–420/67385–8100; OIG 13250–420/17385–8100), prior to changes in the course of the railroad track and widening the road. The survey, undertaken on behalf of the Israel Antiquities Authority and underwritten by the Israel Railways Authority and the Department of Public Works, was directed by Y. Dagan, L. Barda (GPS) and D. Barkan. 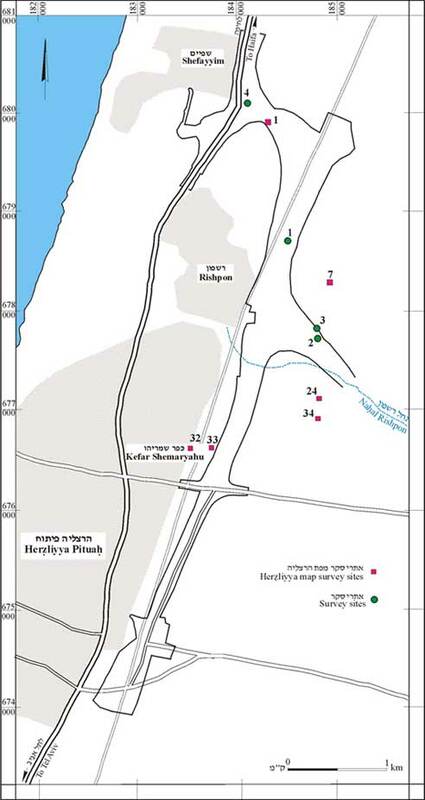 A strip of land (length 5.2 km, width c. 200 m), which mostly runs along the railroad track, a little between the railroad and Highway 2 and along the road close to Shefayyim, was surveyed (Fig. 1). This is an alluvial region where a marsh develops or winter puddles accumulate. Most of the area is intensively cultivated and has been through much development activity. 1) Map ref. 18447/67869 – meager scattering of non-diagnostic potsherds (1.5 dunams). 2) Map ref. 18483/67772 – settlement remains (c. 1.3 dunams). Numerous potsherds that mostly dated to the Byzantine period were scattered along surface. 3) Map ref. 18483/67775 – small heaps of kurkar building stones along the fringes of the settlement (Site 2). Modern building debris piled up nearby. 4) Map ref. 18411/68008 – meager scattering of flint, including three implements that could not be dated and worn potsherds (c. 750 sq m).